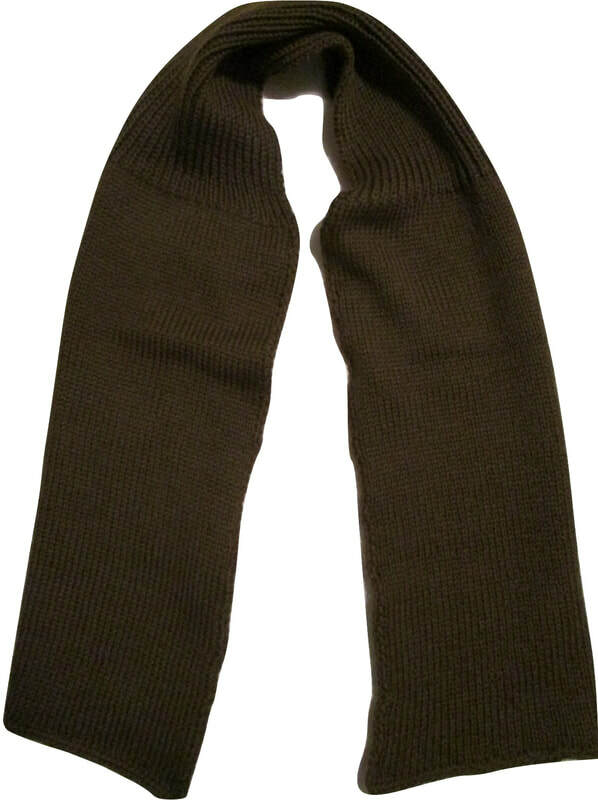 WWII scarves, wristlets/fingerless gloves, trigger gloves, full gloves, and more. All handmade from the original WWII patterns. These are all knitted in pure wool in colors of your choice. Scarves range in price from $35 to $65, depending on length. Gloves/wristlets range in price from $30 to $40. Please contact me with any questions or to custom order. 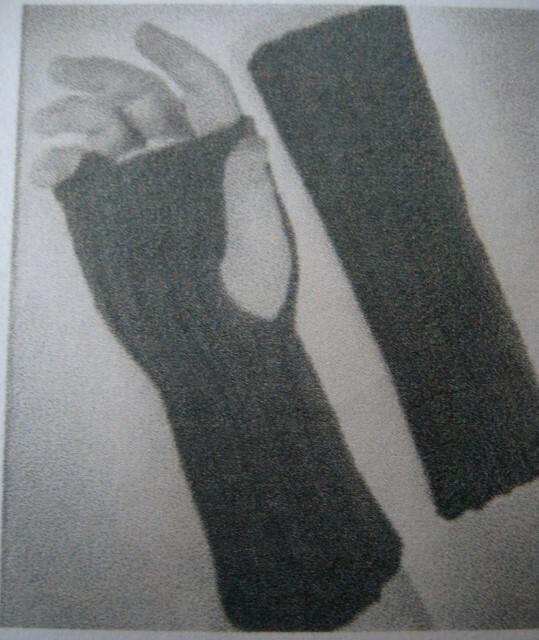 This is the original pattern photo from 1940 for a pair of wristlets (sometimes called fingerless gloves). 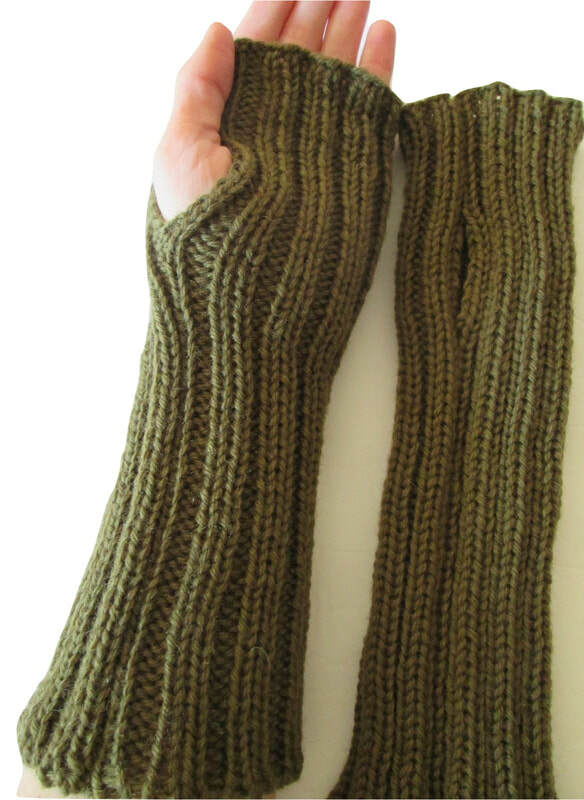 Here are the wristlets I knitted in olive drab wool. These are a pair of wristlets that I custom made for a customer. He had a pair of original WWII wristlets that he mailed to me to copy so that he could have a new pair. These have a stitch between the middle and third finger. WWII Trigger Gloves. Original pattern photo from 1940. Here is one of the Trigger Gloves that I knitted. 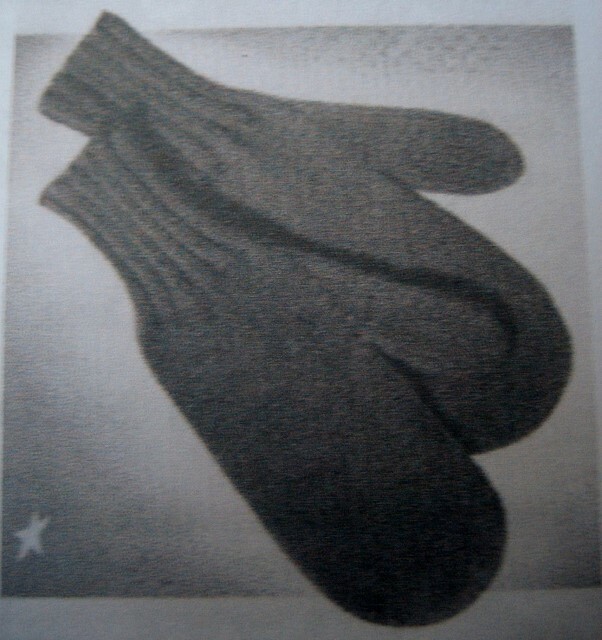 WWII mittens. Original 1940 pattern photo. WWII full fingered gloves. Original 1940 pattern photo. 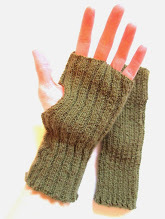 The WWII gloves that I knitted. WWII scarf. This a basic scarf. Original 1940 pattern photo. This is a WWII U.S. Army Red Cross scarf that I knitted. The pattern is from 1943. 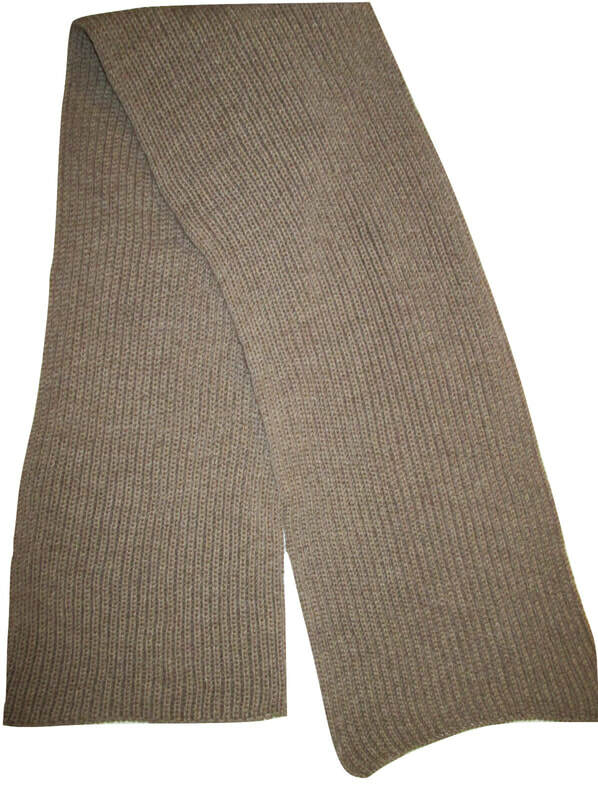 The U.S. Army Red Cross scarf I knitted from the 1943 pattern. 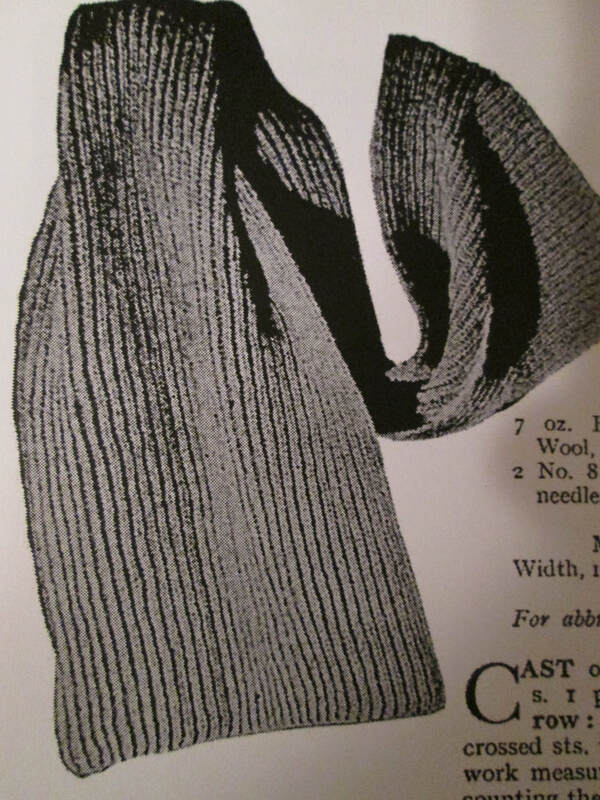 This original pattern photo of a Scarf in Brioche Stitch is from a 1935 British pattern book I have that features various patterns "for our sailors, soldiers, and airmen." 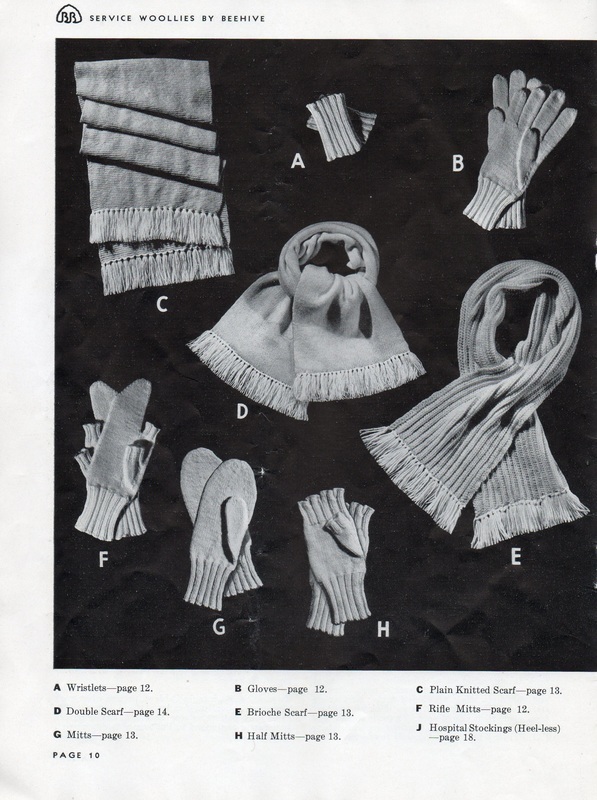 The Brioche Stitch scarf shows up in WWI and WWII. 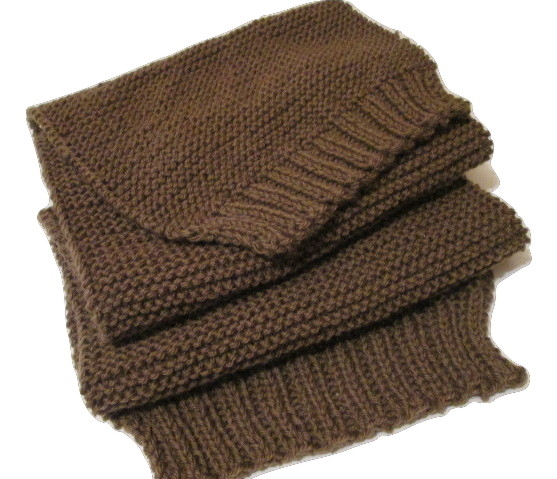 The Brioche Knit scarf I made in khaki colored wool yarn. This scarf is from a 1941 pattern. It has ribbing in the middle section, meant to be worn around the neck. Then the flat knitted sides cross over in the front. It was especially designed for a smooth fit with a jacket or coat. 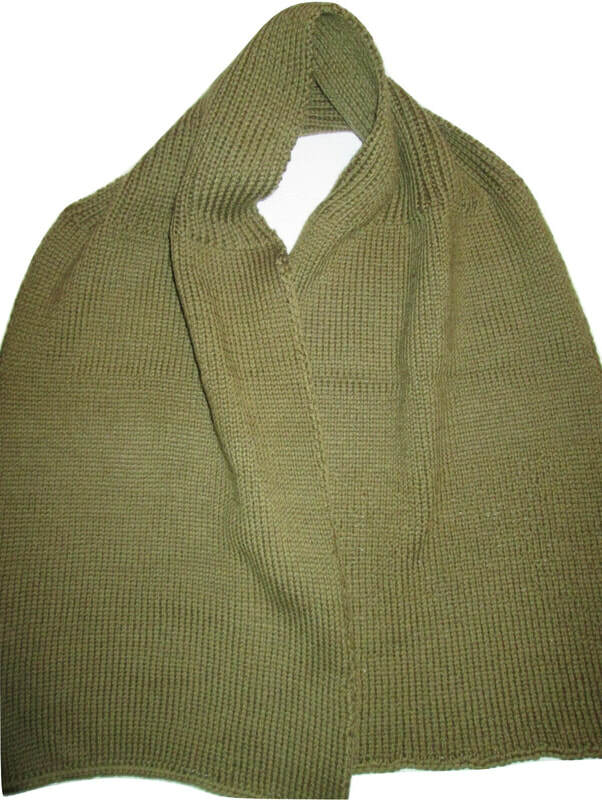 This photo shows the same scarf, but with the camera flash, which shows the olive green with a brighter appearance. Also the scarf isn't folded in half like in the other photo to show its actual width. This is a page from the book, "Service Woollies for Air, Land and Sea" by Beehive. As you can see, there are a variety of scarves and hand-wear to choose from. Here are the "H" half-mitts from the book above that I knitted. Another photo of the "H" half-mitts that I made. 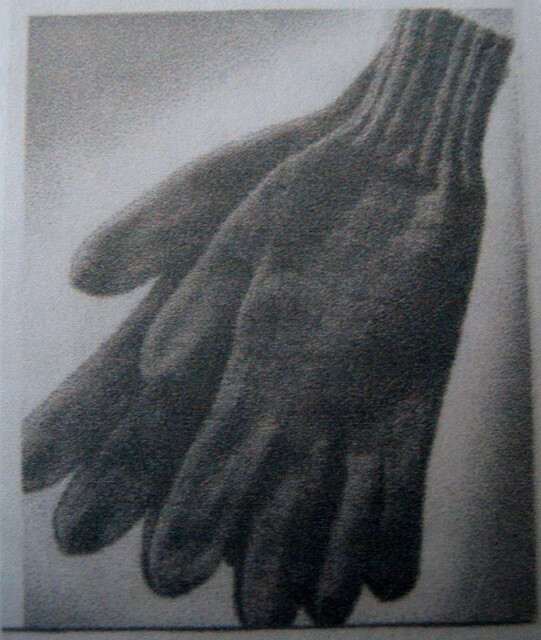 They have ribbing at the top of the hand, which then separates into separate finger holes at the very top. This is the "E" Brioche Scarf that I knitted, also from the book above. These are "B" Gloves that I knitted from the Canadian book.